You guessed it, another State repeat. In fact for this one it was our only exact race event repeat. For States we had to repeat we’ve always tried to choose a different race, but for North Dakota there aren’t a lot of options. We went back to Bismarck and tried to replicate our finishing picture exactly 1 year on.. but not replicate our last finishing time! Full details of how we got on are here. 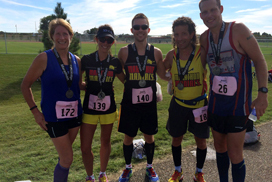 Posted in Marathon Race Reports and tagged 2015, bismarck, marathon, ND, north dakota, running.